There is an old Japanese saying: “Fall seven, rise eight.” You have to fall down to rise up. Duckworth tells us: “Grit rests on the expectation that our own efforts can improve our future. I have a feeling tomorrow will be better is different from I resolve to make tomorrow better. The hope that gritty people have has nothing to do with luck and everything to do with getting up again.” When I first started my blog, We Said Go Travel, I had an editor at a site called Technorati who used to send back my articles 4 or 5 times. It never bothered me to try again because I knew I was learning a different style of writing. When someone suggested that I should learn to shoot video; I listened. I bought a used Cisco Flip video camera on Ebay for $50 and took it on my next trip to Taiwan. When I returned, I said to my 5th grade science class: “I shot all this video on my trip, but I do not know how to make a movie.” I have no idea what inspired me to say it but it changed my life. My student, Hannah, came up to me at the end of class and said, “Ms. Niver, I will stay in at recess and teach you iMovie.” That 8 minute lesson started me on my way to creating videos for YouTube, Smithsonian and KTLA TV. I had the pleasure of interviewing Lisa Niver. 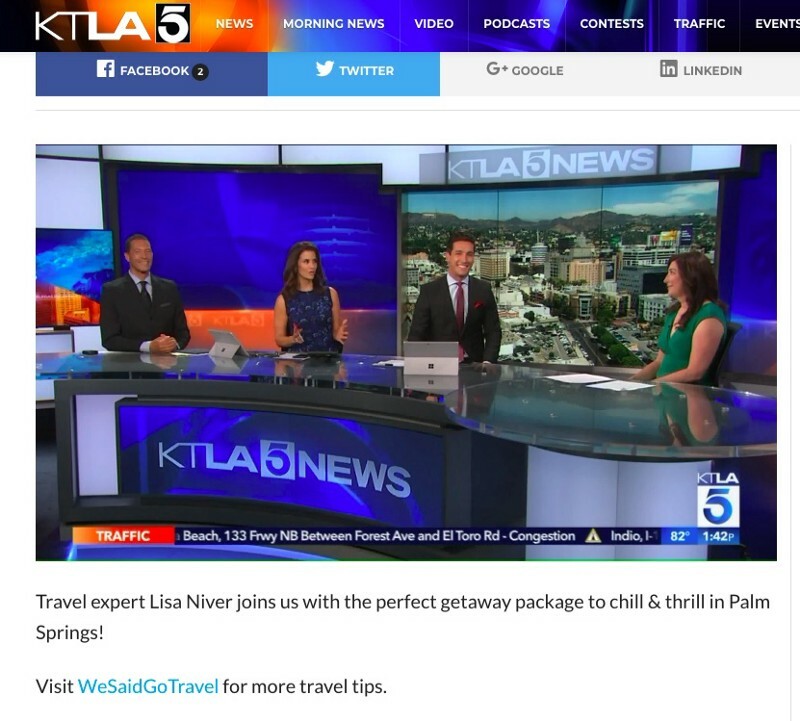 Lisa is a travel journalist and the founder of We Said Go Travel which is read in over 200 countries. She sailed for seven years working for three different cruise lines and has visited more than 100 countries on 6 continents. 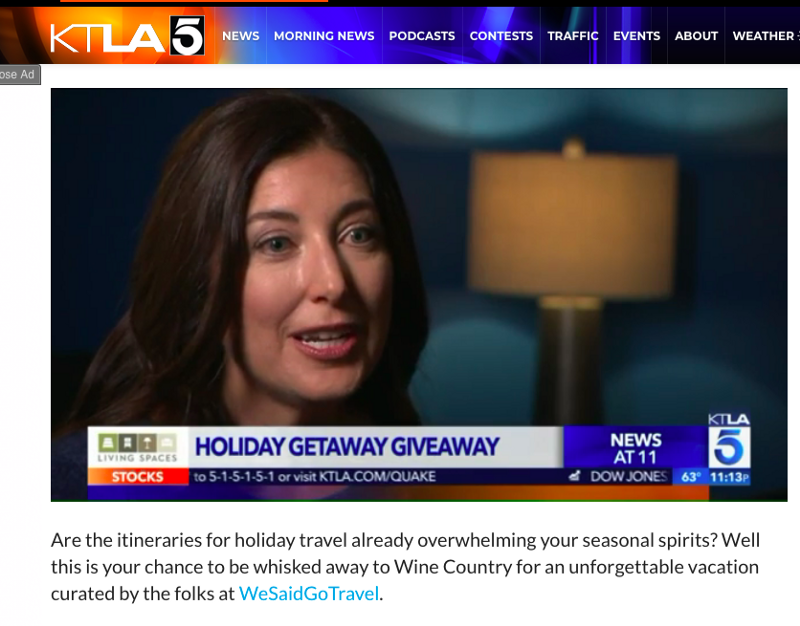 She shares her travel stories on TV for KTLA, on her YouTube channel with nearly 900,000 views and in stories for Ms. Magazine, AARP, American Airlines and others. When I was 11 years old and my sister was 9, my parents took us on a cruise in the Mediterranean. I saw the Parthenon in Greece and the pyramids in Egypt, and I felt like my history books had come to life. I was mesmerized by all of the incredible places. I have always wanted to see more and learn the stories of the people where I visit. After an eleven month adventure, I decided to give a talk at my temple called, “Uncovering Jewish Morocco,” to promote my first book. One of the Rabbis told me it was not a very good idea, he said, “how will you feel when no one shows up?” I responded “Well, I am by myself now, so I think it will be okay.” It turned out that over 40 people came to my talk and it was a great success. I read marketing guru, Seth Godin’s books and emails, and at that time he was fond of saying: “Artists Ship.” He encouraged entrepreneurs and artists of all types to share what they were working on as soon as possible and not wait for perfection. I was not sure I was ready to give a talk or that I was the best person to speak on Jewish Morocco, but I had the idea and I went for it. While promoting that talk, other doors opened. I was introduced to the Editor-in-chief of the Jewish Journal. He offered me a column which still runs today! (http://www.jewishjournal.com/wesaidgotravel) Writing for the Jewish Journal has been a great opportunity, in fact, I won an award for one of my articles from the Southern California Journalism Awards. In my late 40s, I was diagnosed with an eye condition called left intermittent esotropia. I had it since I was little, but I never was diagnosed. What I did know was that other kids were much better at sports than me and just figured that I was clumsy. Little did I know, there was a medical reason why it was hard for me. As an adult my eye doctor explained: “You have always had to work harder to keep up with everyone else.” After a year of weekly vision therapy and daily homework, I noticed the difference of vision therapy. When I went skiing, I was amazed to see and experience the mountain with my eyes working together. It brought me fresh understanding about why I used to get so scared on the slopes and cry on the side of the mountain when I was a little girl. I have made great progress, and now challenge myself to see all the new things I can accomplish. After traveling in Asia for 18 months, I returned to Los Angeles and got two job offers. One was to be a set teacher for a Nickelodeon series, and the other was to be a freelancer for USA Today in the 10Best section. I was not sure if I should keep teaching but in a new way as a studio teacher or start to shift my focus from teaching to journalism. I chose to do both, it was a great choice for me and enabled me to slowly transition to focus more on writing and video. I learned as much as I could from the two very different paths, and it helped clarify what I wanted to do next. 2018 has been a great year for me. 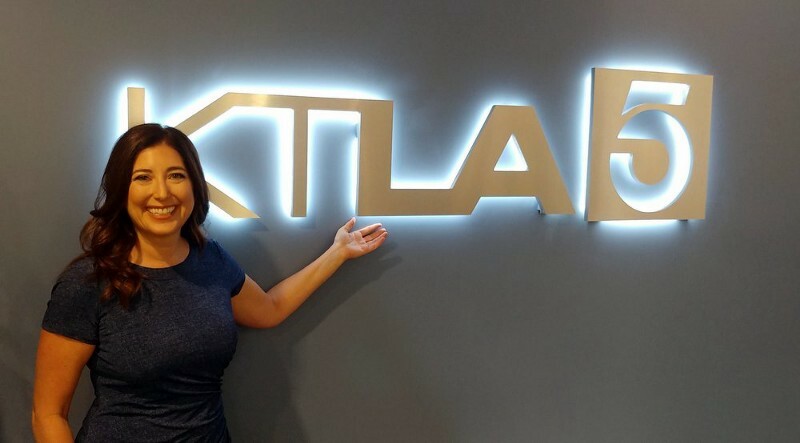 I was a finalist in three categories for the Southern California Journalism Awards, I recently started to write for Ms. Magazine and I completed two travel segments on TV for KTLA. My YouTube channel is now nearly at 900,000 views and I am verified on both Facebook and Twitter. 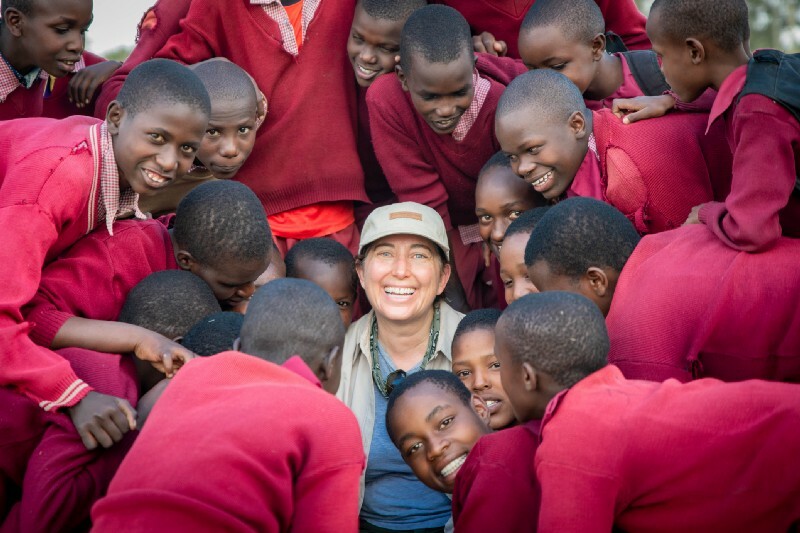 I was so excited to experience my first African safari, which allowed me to travel to my 100th country. 1. Angela Duckworth’s book, Grit: The Power of Passion and Perseverance, really helped me think about the pathway to success. The skills we need are learnable but you have to commit to the time and training required. I thought about this often last year as I was pitching a story about a women’s economic development project in Africa. Many editors told me that it was a great story but not for them. I never gave up. I kept pitching it, and one day I met an editor who said, “That is a great story. I want to publish it.” I try to remember that I am always one yes away from getting what I want and that: “Rome wasn’t built in a day.” Creating a new career takes effort. I did not go to journalism school and have been learning through trial and error. My networking skills honed from working for years on cruise ships as well as my persistence has helped me stay the course. 3. Duckworth includes one of my favorite parables in her book: Three bricklayers are asked: “What are you doing?” The first says, “I am laying bricks.” The second says, “I am building a church.” And the third says, “I am building the house of God.” The first bricklayer has a job. The second has a career. The third has a calling. I wanted a calling and thought that I had found it. After graduating from the University of Pennsylvania (where Duckworth is now a professor), I went to UCSF Medical school. After my first semester, I found myself listening to a little voice inside me that said, “Do not make me go back there.” It was a hard decision to consider taking a leave of absence, but it was the right choice for me. I spent a semester working as a preschool teacher as well as a counselor at Planned Parenthood. I thought about what I wanted my life to be like, and I chose to leave medical school. Many people told me I was making a terrible mistake. It was a challenging time to bravely get off the course I had been on for many years. Teaching eventually led me to pursue travel. Looking back, I can see that all of my decisions led me to be the journalist that I am today but it was not always easy to connect the dots. 4. Duckworth explains: “Most grit paragons I’ve interviewed told me they spent years exploring several different interests, and the one that eventually came to occupy all of their waking (and some sleeping) thoughts wasn’t recognizably their life’s destiny on first acquaintance,” which made me feel better about some of my literal wanderings around the world. I remember when I first interviewed for a job at Club Med, they offered me a job at a ski village called Copper Mountain in Colorado. 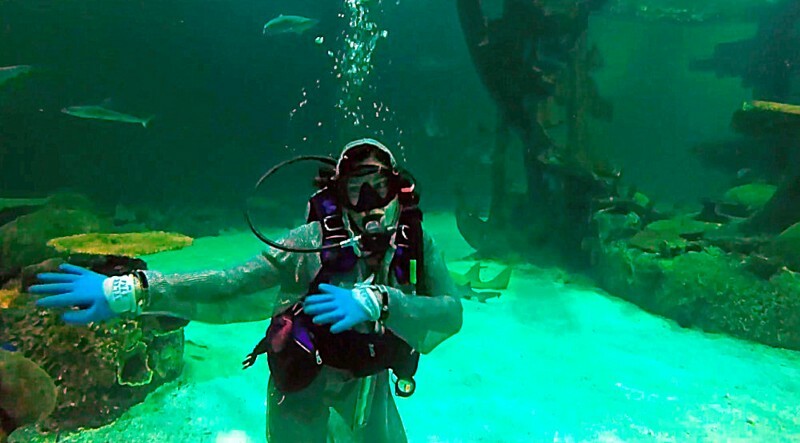 I had just recently acquired my SCUBA certification and couldn’t wait to use it. I was completely disinterested in living in the snow. The woman who interviewed me suggested I think about it over the weekend. I flew back to San Francisco and went on my first weekend live-aboard dive trip out of Monterey Bay. We were in very rough seas for over 24 hours and I was sick much of the time. I screamed into the wind, “I am moving to the mountains.” I sometimes think that if that dive trip had calm seas and sunshine, I might never have joined the Club Med team. And, if I never worked at Club Med, I would not have met cruise ship employees who encouraged me to try out working on ships. Each situation leads to the next; being open minded is essential. Sometimes what we believe is a failure is just a pivot towards where you are meant to explore next. 5. There is an old Japanese saying: “Fall seven, rise eight.” You have to fall down to rise up. Duckworth tells us: “Grit rests on the expectation that our own efforts can improve our future. I have a feeling tomorrow will be better is different from I resolve to make tomorrow better. The hope that gritty people have has nothing to do with luck and everything to do with getting up again.” When I first started my blog, We Said Go Travel, I had an editor at a site called Technorati who used to send back my articles 4 or 5 times. It never bothered me to try again because I knew I was learning a different style of writing. When someone suggested that I should learn to shoot video; I listened. I bought a used Cisco Flip video camera on Ebay for $50 and took it on my next trip to Taiwan. When I returned, I said to my 5th grade science class: “I shot all this video on my trip, but I do not know how to make a movie.” I have no idea what inspired me to say it but it changed my life. My student, Hannah, came up to me at the end of class and said, “Ms. Niver, I will stay in at recess and teach you iMovie.” That 8 minute lesson started me on my way to creating videos for YouTube, Smithsonian and KTLA TV. My high school English teacher, Joannie Parker, who also taught Women’s Studies at Westlake School for Girls in Los Angeles, has been a role model and mentor. She inspired us to participate in Hands Across America and to register voters for a presidential election. In class, she used to say to us, “When you are president of a company or the United States of America, this is the change you can make.” When my first article went live for Ms. Magazine this year, she was the first person I called. She has always been rooting for me to succeed and I value her lifelong guidance and friendship. I love shining a light on different people and their bold experiences. 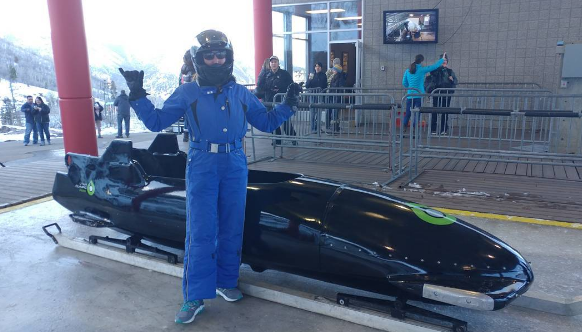 Writing about 14 year-old Saylor O’Brien, I learned about the Paralympic Alpine Development Team, spinal bifida and the motivation to compete at such a high level. People who have read my stories about the programs of the National Ability Center say they are inspired to try new things. My next print story for Ms. Magazine is about a women’s economic development project in Africa. I feel honored to share these important stories. I challenged myself to do 50 new things before my 50th birthday. I started out with small challenges, and it grew from there. If my 50 year-old self had called my 49 year-old self and said in 12 months you will be willing to jump out of a perfectly well maintained airplane, I would have hung up! 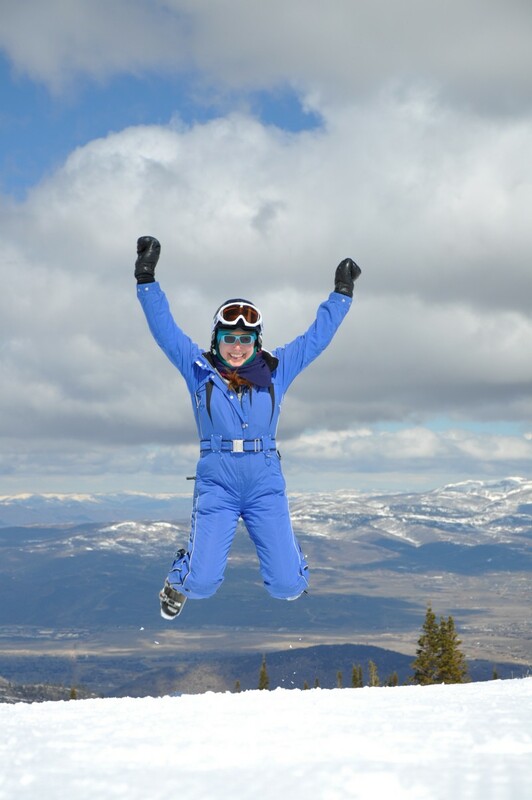 I cannot believe all of the scary activities I accomplished from shark diving to sky diving! I am now working on a book about my adventures because people have called me brave and courageous, and I want to share my challenges and experiences to inspire others. The scariest challenge for me was mountain biking down Northstar California Resort’s ski slopes in Lake Tahoe. I only was able to go through with it because my friend, Marcie, offered to do it with me. I asked for a private lesson with a teacher who would not mind a grown woman crying. They thought I was joking about the crying part, but in fact, I did cry when my instructor, Shep, suggested taking me on an intermediate run. I was so scared; I really thought I could die. He said that he believed in me, that I was doing so well and that I needed to expand my comfort zone. After successfully getting down the blue run, I was invigorated and amazed — soaring down the mountain with so much support was wonderful. I want other people to try new things too. My best advice about working with a team is to focus on what others want. When I was working for Renaissance Cruises as Senior Assistant Cruise Director, one of my team members asked not to be assigned to the golf simulator or to early morning activities. He offered to work more shifts at other times as long as he could sleep in the mornings. During his contract, I never assigned Paul to either of those things. The day he was leaving, he asked to have a meeting with me and explained to me how he couldn’t believe he’d gotten so lucky not having to work at the golf simulator. He did not remember our meeting where I asked about his preferred work schedule. He was thrilled with his experience and, as a result, so was I.
I worked on many cruise ship teams where everything had to be the exact same for every member of the team to be “fair.” We all did the same number of tasks a day and everyone had to do the same number of early morning or late night shifts, but that approach did not make anyone happy. I used to trade shifts with Gavin, who is now a cruise director. If there was an opportunity to scuba dive, I took off and he worked, and if there was golf, the reverse would happen. We were both satisfied this way. I always try to remember that when you supervise people, if you listen, you can help them to reach their goals and have happier and more productive team members. When I worked on the cruise ships, I would remark, “That’s not nice” when I saw things that were just not right. I remember someone said to me, “What are you, The Nice Police?” I said, “Yes, I am.” After teaching preschool, elementary and middle school, I often would slip into my school hallway persona and comment on people’s behavior. I think it is important that we are kind to one another and say please, thank you and take care of each other. When you work on a ship, if there is an emergency, no one else is coming; the team onboard must work together and solve the issues. Part of teaching and being a cruise ship officer requires you to be responsible in many situations. I have always been an upstander and not a bystander. I wish that more people would take action to assist those around them. You never know what someone is going through and how a kind word might really help them. I am okay with being labeled the Nice Police and maybe other people want to join in and be kind! After reading this quote, many books and working with a great therapist, I was able to construct a new future. I accepted that I could not change the past, but I could make new and different choices in the present. It seems sort of obvious to say it now, but it was a very challenging transition. It felt like leaving medical school all over again. I felt like I was not living up to expectations of what my life could have been or should be, but I had to start on a different route. Thankfully my friends and family were there to support me, and I could lean on them and find my footing. While I did not like the process of being so sad, I am thrilled with the new direction that I took and where my life is today. I am excited to see what will happen next with my writing, my videos and my journeys. I appreciate how many people have been watching and following along.